Recognizing the increasing number of socio-environmental conflicts surrounding resource extraction in Latin America over the last decade, this three-year research project aims to study the nature and outcome of currently available mechanisms for conflict resolution. Project partners: Noragric, University of Stockholm, GIGA German Institute of Global and Area Studies, University of north Carolina at Chapel Hill, Rainforest Foundation Norway, Universidad del Valle (Cali-Colombia), Proceso de comunidades negros (Colombia), CIESAS-Mexico, Observatorio de conflictos ambientales – UTPL (Ecuador). The project in particular questions whether ‘prior consultation’ and ‘free, prior and informed consent’ (FPIC) processes represent a set of effective mechanisms for preventing and resolving resource conflicts. Whilst also considering the potential for resolution, in this project we intend to go beyond this to ask how consultation, consent and compensation practices strengthen or weaken affected peoples’ democratic participation and rights to self-determination. Consultations with different indigenous peoples and Afro-descendant and peasant groups involve the meeting, translation and negotiation between different cultural traditions, worldviews, forms of knowledge and perceptions of nature. A central focus of the project is therefore to study empirically the cultural dimension of desirable and un-desirable processes and outcomes. The project is interdisciplinary in nature and involves research partners from nine different university and research institutions and civil society based organizations in Europe, Latin America and the US. The project will furthermore produce a series of country specific case studies from Bolivia, Colombia, Ecuador and Peru. The case studies will capture local dynamics and histories whilst also considering consultation, consent and benefit-sharing/compensatory practices within a wider domain of national and regional politics and economics. 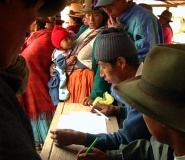 The project has specific policy relevance in relation to ongoing initiatives to develop and implement FPIC guidelines and principles by national governments and by international institutions and actors such as the UN Special Representative on Indigenous Peoples Rights, the UN Special representative on Business and Human Rights, the International Council on Mining and Minerals, the World Bank and the Inter-American Development Bank.